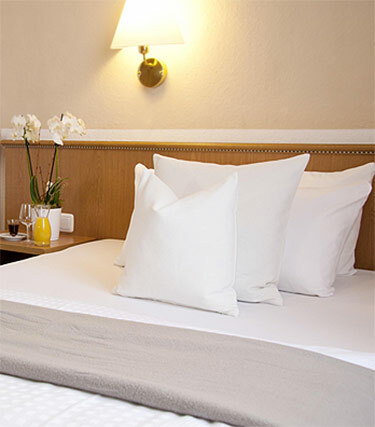 Ten double rooms, 5 single rooms and three rooms with three beds or junior suite await you in our hotel. 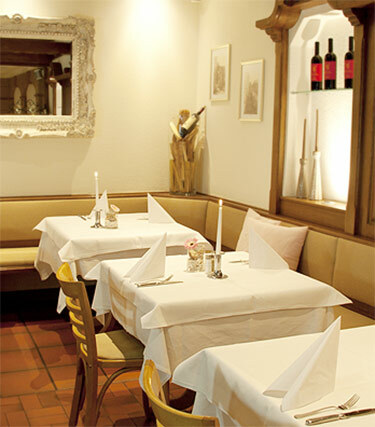 Our restaurant with Italian specialties leaves no desires unfulfilled. Look forward to Italian hospitality in Mediterranean atmosphere. Here you can book your room directly online. Data protection has always been and still is very important to us. Therefore you should first contact the above person in case you have any questions. Ms. Lorena De Matteis, Lange Zeile 14, 85435 Erding, E-mail: info@www.stadthotel-erding.de Ms. De Matteis will gladly answer all your questions regarding our data privacy statement. For an ideal presentation of our website the applied internet program saves so-called cookies in your internet browser (Art. 6 para. 1 f of the GDPR). Cookies are text files which your internet browser receives and saves on your computer. cookies which are necessary for the operation of the website, otherwise the functionality of the website can be limited, or parts of the site might not work (necessary session cookies) and cookies which serve to analyse usage patterns on the website in order to determine visitor numbers and improve the site. Analysis data are collected anonymised. and cookies used by third-party providers in order to post online advertising, which you might be interested in (third-party providers’ cookies). On this website we only use necessary session and analysis cookies (Art. 6 para. 1 f of the GDPR) which are being stored in your system. We only provide links to social media websites. You can object to such recording by setting your internet browser to not accepting cookies or deleting those cookies upon ending the internet connection to our sites. If you set your browser to not accepting cookies you might have limited access to our sites due to technical reasons, because our applied internet program which presents our website uses those cookies for intermediate storage of your chosen options. Cookies may contain a cookie ID which allows clear allocation of your internet browser. This means your internet browser can be distinguished from other internet browsers which accessed our website. That way you can be recognised on your next visit and the user experience can be optimised. That way you might not need to enter your user data again, can continue an order and your shopping trolley will still store the goods from your last visit. At any time cookies once set can be deleted or set on limited access by a deletion function offered by all popular internet browsers. We would like to make clear that the personal data which we collect from you are exclusively collected, processed and stored in accordance with the General Data Protection Regulation GDPR and the regulations of the German Federal Data Protection Act (BDSG). Regarding the data collected by us you have special rights which we would like to explain. Even if you can principally use our website without giving any personal data, it might happen that you voluntarily give us your personal data to contact us or to use special services of our website (Art. 6 para. 1 a GDPR). Furthermore, there are legal stipulations which obligate us to collect, process and store personal data (Art. 6 para 1 c GDPR). In as far as there is no legal basis for the collection of personal data we will always ask for your prior consent (Sec. 6 para 1 a GDPR). under Art. 7 para. 3 GDPR to withdraw at any time the consent you have given us. As a result, in the future we will no longer be allowed to carry out the data processing to which this consent relates. Insofar as your personal data is processed based on justified interests under Art. 6 para. 1 p. 1 f GDPR, you have the right under Art. 21 GDPR to lodge an appeal against the processing of your personal data insofar as grounds exist which arise from your special situation or the appeal is directed against direct marketing. In the latter case you have a general right of appeal which will be implemented by us without further specification of a particular situation. (Art. 21 GDPR). In order to exercise your rights please refer to the person responsible for data protection mentioned in the introduction. If you write us an email, the email address will be stored. Furthermore, we collect your name, your address and further contact data such as a phone number if you communicate this in your email and ask us to contact you on a different way of communication. We would like to point out that for entering into contact with you we just need your email address. If you contact us via a contact form offered by us, we will collect the data given by you. If you subscribe to a newsletter offered by us, we will collect your email address and send you the newsletter – after verifying your email address by sending you one email to the email address given by you – at regular or irregular intervals. You can unsubscribe to our newsletter at any time by clicking on the link given in each newsletter. The legal basis for processing your data is Art. 6 para. 1 a GDPR based on a consent given to us for processing, Art. 6 para. 1 b GDPR based on the contractual relationship between you and us, Art. 6 para. 1c GDPR based on our legal obligation , Art. 6 para 1 f GDPR preserving our justified interest which do not infringe your fundamental rights, in connection with Art. 24 German Federal Data Protection Act. If you have any questions hereto please do not hesitate to contact us. The data collected by us will be stored and processed for internal processing in our company for our own purposes in order to be able to offer you our services. The data stored by us will not be passed on to third parties for other than the purposes stated below. as for protecting vital interests of you or another natural person under Art. 6 para 1 d GDPR. information if the access was successful. type of browser and operating system, so that we can send system specific information to your browser to ensure consistent representation of our website. to initiate an encrypted connection between us and your internet browser (SSL). These data are not used to draw conclusions about you. They are collected and stored anonymously to optimise our website, to ensure our systems are working in the long run and – in case we are obliged to do so – to be able to give the necessary information for criminal prosecution to the authorities in case of an attack on our systems. In accordance with the legal regulations, your data, including the text of a [sollte es nicht heißen: des??] contract, will be blocked or deleted after ending the contractual relationship with you and after a possible period of guarantee has expired. This is always the case after 24 months. Furthermore, your data will be blocked or deleted, if the purpose for storing them is no longer pursued or a legally required storing deadline lapses or you require us to delete and there are no legally binding regulations to the contrary. We neither take automated decision based on the data collected from you nor do we conduct profiling from these data. You can also prevent the collection of the data (including IP address) created by the cookie related to your use of the website by Google as well as its processing by Google by downloading and installing the plugin for your web browser under https://tools.google.com/dlpage/gaoptout?hl=en. Alternatively to the browser add-on, particularly with browsers on mobile terminal equipment, you can prevent collection by Google Analytics by clicking on this link. An opt-out cookie will be placed which prevents future collection of your data when visiting this site. The opt-out cookie is only valid for this browser and only for our website and will be installed on your computer. If you delete the cookies on this browser you will have to renew your opt-out selection. [Note: For tips for incorporating the opt-out cookie please go to: https://developers.google.com/analytics/devguides/collection/gajs/?hl=de#disable]. Furthermore, we use Google Analytics for evaluating data from double click cookies and AdWords for analytical reasons. If you do not want this please deactivate it with the Ads Preferences Manager (http://www.google.com/settings/ads/onweb/?hl=de). You will find further information regarding data protection in connection with Google Analytics in Google Analytics Help (https://support.google.com/analytics/answer/6004245?hl=de). We do not use plugins of social media such as Facebook, Google+, Twitter, Instagram or others. Data protection declaration for using the booking system DIRS21. We would like to strengthen your trust in the booking system DIRS21 of the operator “TourOnline AG, Borsigstraße 26, 73249 Wernau, info@dirs21.de, phone: +49 (0) 7153 9250 0“ for booking hotels, hosts and package deals and for making the process of booking and the data collected while booking more transparent. For this reason you learn here which information is collected from you and how this information is processed. Anonymous search for free rooms, hotels or package deals with DIRS21. For availability queries in hotels and other hosts, you do not have to provide any personal data. If you want to book a room or a package, your personal data are required for booking, particularly name, address, phone number and email address. For each booking these data are stored in the system under a booking number which is communicated to the booked host via fax. The booked host can review these data in a secure customer area only accessible by him. Export or automatic processing is not possible. We would like to expressly point out that your email will not be used for marketing or mass mailing purposes. Anonymised data will be processed for statistical purposes. We can use third-party service providers to process your personal data in this task for the above mentioned purposes. For example, we can pass on some information about you to third parties so that they can contact you directly via email (e.g. to get an evaluation of your stay). The booking system DIRS21 does not use any “cookies”. As a user of the booking system DIRS21 embedded in this website you will be informed by the operator “TourOnline AG” which information about you was collected by the system. This service is free of charge, if required please refer to kundenservice@dirs21.de by email or to the DIRS21 customer hotline on 0049 7153 925050. Deleting your personal data from the booking system DIRS21 If you so desire, the operator “TourOnline AG” will delete the personal data collected in the booking system DIRS21 as soon as the date of arrival advised in the booking has been reached. This service is free of charge, if required please refer to kundenservice@dirs21.de by email or to the DIRS21 customer hotline on 0049 7153 925050. You will receive a confirmation of the deletion of your data. For further details please refer to the data protection declaration of TourOnline AG http://www.dirs21.de/disclaimer/. We do not use plugins for representations of media content such as YouTube, Vimeo, Getty Pictures or others. In order to consistently represent the fonts on our site on each terminal equipment we use so-called web fonts which are provided by Google Inc., 1600 Amphitheatre Parkway, Mountain View, CA 94043, USA (“Google”). As soon as you load our site your browser connects to Google servers, which are operated world-wide, loads the required web fonts in your cache in order to represent texts and fonts properly. By doing this, Google requires that our website had been called up via your IP address. Cookies, particularly tracking cookies, are not created here. We have a justified commercial interest in having our website represented consistently on all terminal equipment, therefore the use of web fonts under Art. 6 para. 1 f GDPR is permitted. You can block the use of web fonts by blocking the access of Google API or Google server in your browser. In this case, instead of Google web fonts standard fonts will be used by your computer. The use of our website will be restricted by this measure. You will find further information about Google web fonts at https://developers.google.com/fonts/faq and in Google’s data protection declaration at: https://www.google.com/policies/privacy/. All contents of our website were collected with care and to our best knowledge. We cannot assume, however, any responsibility for the accuracy, completeness and timeliness of the contents. According to general legislation pursuant to Art. 7 para. 1 TMG [German Telemedia Act] we are responsible for all our own contents provided on these pages. Furthermore, we provide links for access to third-party information. We are not responsible for third-party information (Art. 8 TMG [German Telemedia Act]) because we have not initiated the transmission, not selected the user of the transmitted information and not selected or changed the transmitted information. Transmitting the information and facilitating access to them requires no automatic temporary intermediate storage of this information based on the type of references. When placing the reference for the first time, third-party information was checked to see whether the person responsible for third-party information might be civilly or criminally liable . As soon as we find out or are informed by third parties, that a link placed by us refers to third-party information which trigger a civil or criminal responsibility of the person responsible for it, the link will be deleted. If you follow such a link, you leave our website and visit a new site upon which we have no influence. In particular, when visiting a new website the data protection regulations of the website you loaded will apply. These can differ from the ones used on this site. Please check out the data protection regulations on the new site carefully.